Sounds New | Music Matters | Because it does. Doesn't it ? New What’s On brochure now out! Our Autumn What’s On is now out, and is bursting with events throughout October to December here in Colyer-Fergusson. 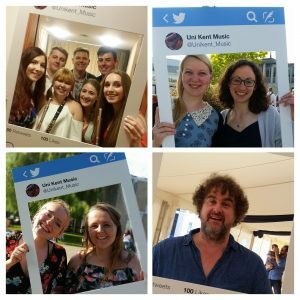 The University Chorus and Symphony Orchestra will be rounding-off the Shakespeare 400 anniversary in style with a concert including the suite from Walton’s famous film score for Henry V, and the Musical Theatre Society will present their ever-popular showcase. The season ends in rousingly festive style with the Big Band’s Christmas Swing-Along. Whatever you do, make sure you have Friday 25 November inked firmly in your diary for what promises to be a memorable concert, as internationally-renowned bass, Sir Willard White, joins forces with the Brodsky Quartet to pay tribute to the relationship between Frank Sinatra and the Hollywood String Quartet; the evening will also include folksongs by Britten and Copland, Barber’s evocative Dover Beach, a selection from Gershwin’s Porgy and Bess, the Great American Song Book …and much more. Early booking is most definitely advisable! As ever, we also welcome the many visiting musicians to Colyer-Fergusson, including events promoted by both the Canterbury Festival and Sounds New and a birthday concert for Trevor Pinnock. You can find out more about all these events online here, or download the new brochure here. We look forward to welcoming you to Colyer-Fergusson this season! The annual Sounds New Festival of Contemporary Music will blossom around Canterbury towards the end of next week, and we’re very excited to be a partner in this year’s festival as it brings two vibrant headline concerts to the Colyer-Fergusson Building. The boundary-trashing Icebreaker Ensemble will be here on Saturday 3 May in a performance of Brian Eno’s Apollo for all Mankind, as well as the première of composer Ed Bennett’s Suspect Device and music by Julia Wolfe. The Brodsky Quartet will be here on Thursday 8 May with a celebration of the music of prog-rock legend Robert Wyatt; the former Soft Machine founder’s music will be realised in a blend of strings, improvisation and live electronics, including singer Elaine Mitchener and Matt Wright. The festival also features the Sounds New Poetry strand, with members of the University Centre for Modern Poetry in site-specific residencies in the city. Find out more about all the events happening at Sounds New online here. I’m reminded anew of this article in the Guardian some months ago about the impact culture and the arts are having in East Kent. the arts are leading the way in raising the profile of the area as a desirable destination. From Whitstable to Folkestone, Canterbury to Dover, arts and culture are making a significant contribution to the tourism offer. With the tourist industry bringing in ‘£3.2bn’ to the area annually, the partnership between the arts, heritage and the tourist industry is rejuvenating the county’s economic development, bringing visitors to historic and cultural attractions throughout the region. Last year’s bid for East Kent as ‘City of Culture,’ drawn up by collaboration across venues and organisations across East Kent. 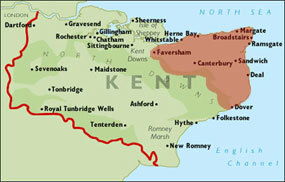 may not have been successful, it’s true, but it does reflect a changing mentality across the county, triangulated in investment in iconic venues such as the recently-refurbished Marlowe Theatre and Beaney House of Art and Knowledge, the Turner Contemporary in Margate, and the University’s own award-winning Colyer-Fergusson Building. Since 2011, Revelation St Mary‘s has been developing an exciting series of events at the heart of Ashford town, and there are festivals such as the Canterbury Festival, Deal Festival, Lounge on the Farm, and Sounds New attracting major performers to the area; this year, in May, the new Whitstable Literary Festival will be launched. There’s a sense that professionals across these industries locally are starting to forge working relationships, building on the sense nascent in the City of Culture bid that there is a vibrant county-wide cultural presence that can make a significant contribution towards supporting regional economic growth. 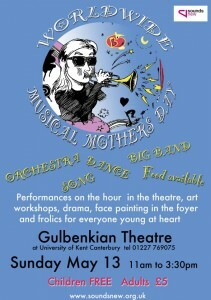 We’ve certainly noticed an increased cultural vibrancy both here and next door in the Gulbenkian Theatre, with its developing partner-groups and youth theatre projects, and the number of local, regional and national performers coming into the music building; Kent really does have a lively artistic scene, one that engages the community across the age-range and brings them a high standard of artistic experience The recent high-speed rail link means Canterbury, Ashford and Margate are within easy reach of London, and are now more readily accessible. Notwithstanding the impact the Colyer-Fergusson building is having on the student experience and music-making provision on the campus, it’s exciting to see it forming a part of the cultural landscape developing across Kent. The wonderfully eclectic mix of music, drama, dance, art, comedy, lectures and more that is the Canterbury Festival swings into acton this Saturday, offering two weeks of artistic celebration at the heart of the city and beyond. Local star of the international piano world, Freddy Kempf, will be performing Rachmaninov’s Third Piano Concerto, which (in my humble opinion) is an even greater work than its more celebrated cousin, the second piano concerto; accompanied by the St Petersburg Symphony Orchestra, the concert at the Marlowe Theatre opens this year’s festival this Saturday. Contemporary music-lovers can look forward to the world première of When The Flame Dies by Ed Hughes at St Augustine Hall on Wednesday 17 October, in association with Sounds New. Soloists from the Philharmonia bring Stravinsky’s spirited The Soldier’s Tale to St Gregory’s Centre on Sunday 21st October. The legendary Van Morrison will be at the Marlowe on two nights, Tuesday 23rd / Wednesday 24th. Stand-up comedy from Jo Caulfield, Sean Hughes and Mark Thomas will fill the Gulbenkian Theatre with laughter on various dates, whilst Marcus Brigstocke visits Shirley Hall at the King’s School. Family events include the opening Festival Parade through the city streets this Saturday including carnival bands and a Chinese Dragon, and several family shows at the Gulbenkian each weekend. Find out more on the festival website here. Jazz Booth, Notes on Music, Now Hear This! My review of last night’s barn-storming gig by the Julian Joseph Trio (and surprise guest) has gone onto the Sounds New Festival’s blog this morning: you can read it here. 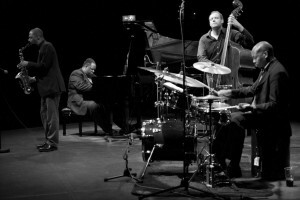 Colossus of the British jazz world, fearlessly inventive pianist, presenter on Radio 3, and stalwart of the British jazz scene, Julian Joseph brings his trio to the Gulbenkian Theatre this Sunday. I’ve written more on Julian Joseph here, where he answers ‘Three Questions’ about coming to the Gulbenkian as part of the Sounds New Festival that’s ringing around Canterbury at the moment. The Gulbenkian Theatre will be bursting with music, art, face-painting and more on Sunday to celebrate Worldwide Mothers’ Day as part of Sounds New Festival this year. From 11am to 3.30pm, Musical Mother’s Day will include performances on the hour, every hour, including art and drama workshops, song, dance, instrumental music, flowery fun, food and more, in an event that will please youngsters of all ages! 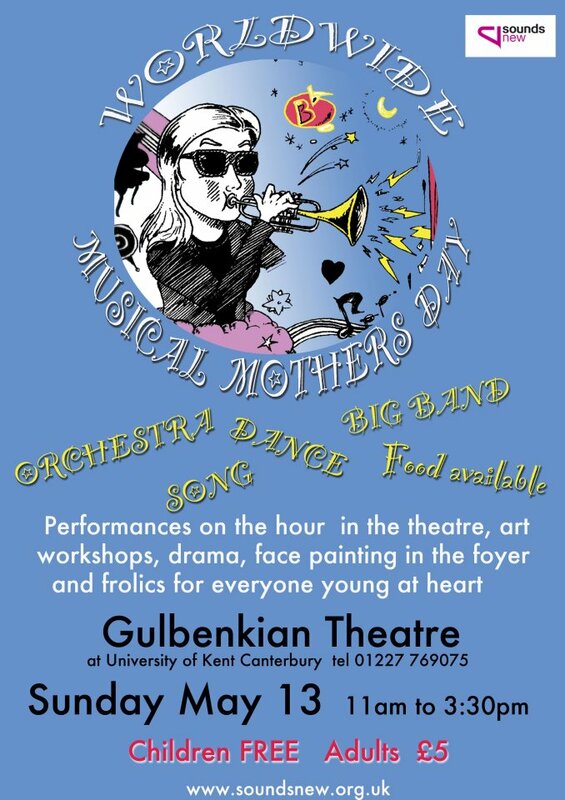 From 12pm at regular intervals throughout the day, events will feature Canterbury Christ Church Chamber Orchestra, Canterbury Youth Music Big Band, Wide-Eyed Theatre, Dance Warehouse and Simon Langton Girls School dancers and much, much more! In the afternoon, eminent British jazz pianist Julian Joseph will lead a jazz workshop, prior to his trio’s evening concert later on. The event is free to children and £5 for adults. More details here: come and join the fun! Saturday 5th May… What an exciting day! In the morning, I was invited to play my tenor sax in Whitefriars shopping centre in town with ‘Big Brand New’, an exciting new band set up by Peter Cook and the music department at Langton Girls School. Big Brand New is somewhat of a hybrid between a ‘traditional’ big band, and a junk orchestra! The musicians are from local schools, and a few University students, from Canterbury Christchurch and Kent. The set started off with a few tunes composed by Peter especially for the band, followed by arrangement of Count Basie’s Flight of the Foo Birds. The final number we player was Herbie Hancock’s ‘Watermelon Man’, for which the ‘junk’ orchestra joined the rest of the band. There were several ingenious instruments being used, the bass line being played on tuned lengths of drainpipe, along with a percussion section comprising of everything from man-hole covers to buckets. There were also some assorted flutes and clarinets made out of lengths of PVC pipe! The band certainly has some great potential, and it was brilliant to see so many young musicians getting stuck into taking solos and improvising… a daunting task, especially in the middle of a busy shopping square! I think that the use of the ‘scrap’ instruments was great – my favourite was the drainpipe bass! – I am very excited to be involved with the band. There is talk of in the future involving some of the school’s keen Music Technology students to mix some live sampling into the band, which will certainly make this band very different to anything else I’ve played in before! 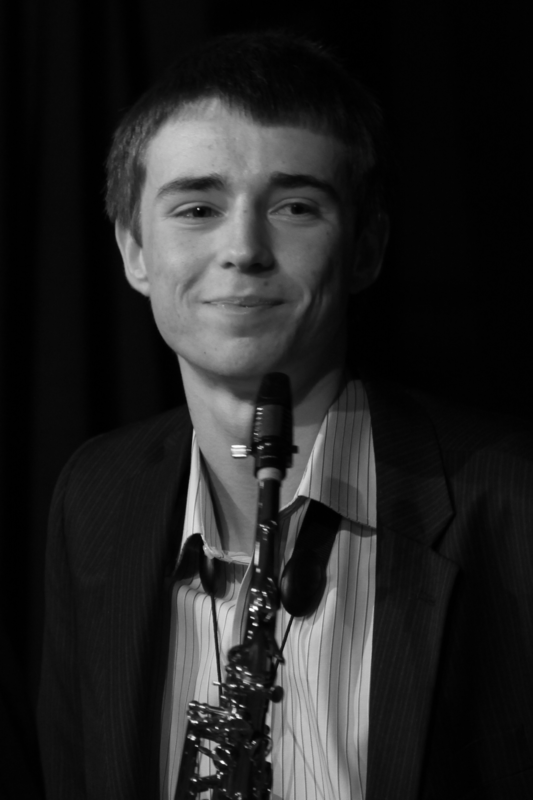 After ‘Big Brand New’ had finished playing, KYJO (The Kent Youth Jazz Orchestra) took to the stage, just as the heavens opened! Despite the weather, they performed a fantastic set, and continued to draw a crowd, despite the conditions! They concluded with a lively performance of Jaco Pastorius’s ‘The Chicken’. Whilst listening to KYJO, myself and another sax player from ‘Big Brand New’ were interviewed by ‘CSR FM’ (97.4FM or online!) for their Saturday evening Jazz Show, 8-9pm. I’m sure there’ll be lots on about Sounds New in the next few weeks, so it’ll be worth tuning in. In the evening, I was lucky enough to have a ticket to watch the BBC Big Band perform at the Gulbenkian… And just wow! I don’t think I need to say much more! The Sounds New Festival of Contemporary Music runs until Tuesday 15 May.